Chad Clinger | Galion Inquirer The Graders Jarett Smetana takes a healthy cut at a pitch during Tuesday’s action against the Hamilton Joes. Galion defeated Hamilton, in walk-off fashion, 5-4. GALION — After dropping a pair of games in Celina against the Grand Lake Mariners over the weekend, the Galion Graders were back in action on Tuesday night against the Hamilton Joes. 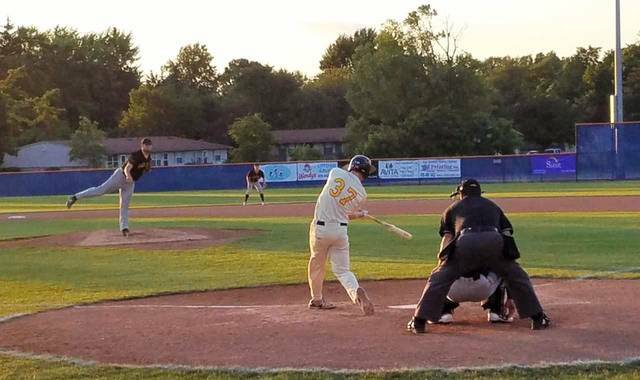 The Joes, last year’s Great Lakes Summer Collegiate League champions traveled to Heddleson Field in Galion on Tuesday for what turned out to be a dozen innings of baseball. The bottom of the 12th inning proved to be the final frame needed to decide a winner as the Graders “walked it off” against the Joes by a final score of 5-4. With the win, Galion is back up to .5oo on the year at 7-7 while Hamilton drops to 4-9 on the season. Justin Longbrake was the starter on the night for the Graders and was touched up early for a run in the top of the first after a lead-off walk and a stolen base put a runner in scoring position for the Joes. A strike out and a fly out to right field kept the runner at second but he was soon delivered home on an RBI double to put the Joes up, 1-0. In the bottom part of the inning, Galion went down in order. Hamilton picked things right back up in the second inning with a lead-off single before two consecutive Longbrake strike outs. Another double off the Hamilton bats put runners at second and third with two outs but would score on the next at bat as an RBI double plated both the runners before a fly out ended the top of the second, stranding a runner at second. No down 3-0, the Graders came up to bat and Jarett Smetana delivered Galion’s first hit, a single and would be moved to third when Josh Kent belted a double. With runners on second and third, Parke Phillips grounded into a fielder’s choice to plate Smetana for the Graders’ first run. Kent would score the second Galion run on an RBI single by Grant Fuller to make the score 3-2 in favor of the visitors after two. Throughout the third and fourth innings, each team managed just one hit apiece, both in the third, with the pitchers settling into their roles. Matt Noel had the Graders lone hit, a single in the bottom of that frame. Galion would strike again in the bottom of the fifth inning after a Jake Hoover ground out to the Hamilton second baseman. Joe Crank reached on a single and was then brought home after a long double by Noel to knot the ball game up at three runs apiece heading into the sixth inning. Innings six through 11 was a fly ball fest. In those six innings, Hamilton scattered just four hits, two off of Longbrake and two off of reliever Brock Balderson that came on to start the ninth. Galion managed three hits in that same time frame. Hoover had a single in the seventh, Braxton Giavedoni a double in the eighth and Austin Hathaway reached on a single in the 10th. In the top of the 12th, Hamilton started a hopeful rally with another lead-off single. After a fly out, Balderson attempted a pick-off move to first and the throw got away to the Joes’ bullpen area, advancing the runner all the way to third base. With the go-ahead runner just 90 feet away, Hamilton laid down a “suicide squeeze” bunt attempt that resulted in a run scored and an infield single. After another fly out and a walk to put runners at first and second, Balderson struck out the final Hamilton batter that he would face to keep the score at 4-3. Down to potentially their final three outs, Graders manager Taylore Baker elected to send Brandt Nowaskie to the plate to bat for Hoover. Nowaskie was sent back to the dugout after a strike out, one down. Crank would walk on four pitches to put the tying run at first for Galion. Noel went down on strikes, putting the Graders down to just one out with a runner on first. Hathaway would draw a hard-earned walk, putting Crank on second. With the potential winning run at first base, into the batter’s box stepped Giavedoni. After swinging through the first pitch, Giavedoni got the pitch that he liked, a high slider that the Hamilton pitcher left too far over the meat of the plate. Braxton drove the ball all the way to the left field fence, allowing both Crank and the speedy Hathaway to score and earn the walk-off double and victory for the home team. Galion scored five runs on 10 hits, committed two errors and stranded nine runners on base. Hamilton scored their four runs on 12 hits, committed one error and left 11 runners on the base path. The Graders will be back in action, at home, tonight against the Joes. First pitch is set to be delivered at 7:05 pm. Galion will welcome the Licking County Settlers to town on Thursday before traveling to Newark on Friday. https://www.galioninquirer.com/wp-content/uploads/sites/38/2017/06/web1_Smetana.jpgChad Clinger | Galion Inquirer The Graders Jarett Smetana takes a healthy cut at a pitch during Tuesday’s action against the Hamilton Joes. Galion defeated Hamilton, in walk-off fashion, 5-4.